What youth has not dreamed of sailing the seas as a pirate captain, seeking fame, glory, and treasure? 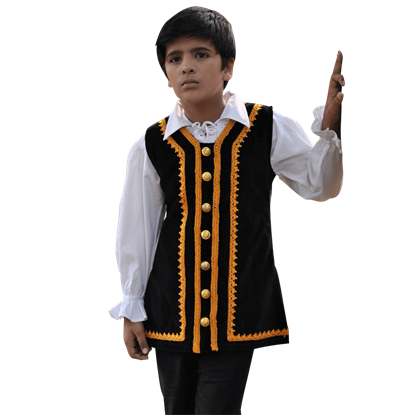 This Captain Enrique Brower Childrens Shirt is a medieval styled garment that is perfect for creating such a look for a young one. What youth has not dreamed of sailing the seas as a pirate captain, seeking fame, glory, and treasure? This Captain Enrique Brower Half-Sleeve Shirt is a medieval styled garment that is perfect for creating such a look for a young one. Good trousers are a must-have for practically any look you might build, whether it is for a noble knight, a squire, or a pirate. These Captain George Booth Kids Pants serve as great slacks for use in equally great looks. 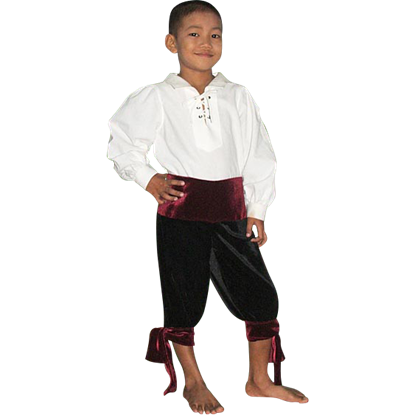 These Childs Pirate Pants make a great addition to your childs pirate outfit. If you are going for more of an authentic look, these pants will be perfect! 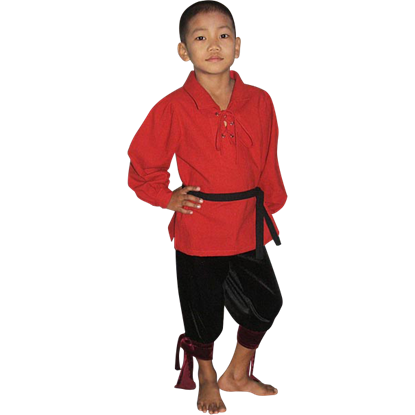 Pair our Childs Pirate Pants with a pirate shirt, scarf, and hat, and you are all set. 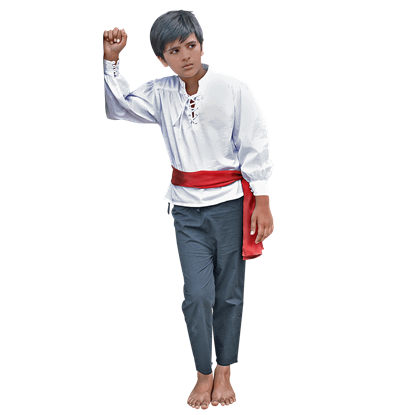 This Childs Pirate Shirt is great for finishing off your childs pirate outfit. The Childs Pirate Shirt makes a great outfit with a pirate pants, scarf, and hat. 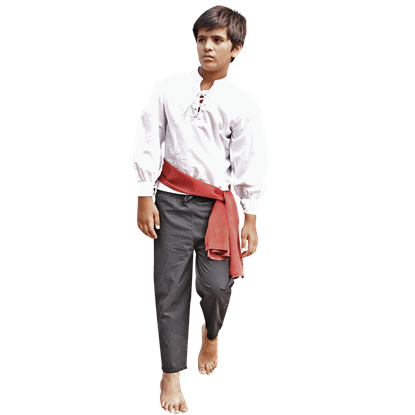 This Childs Pirate Shirt is made of 100% cotton and machine washable. Yo, ho, ho! In the Childs Sailor Vest, your little one will be well on their way to looking the part of a fearsome pirate, who sails the seven seas in search of fame, fortune, adventure - and, of course, lots of treasure! Comfortable and effortless in their look, these David Marteen Kids Pirate Pants have an easy-going style that is quite useful. Long and black, they are a full length trouser that pulls together any number of different styles. The life of a pirate can be rough, so if your skirt gets tattered a bit, that is all part of the swashbuckling, sailing, and adventuring. 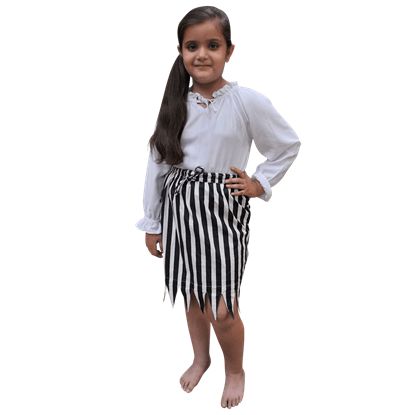 This Girls Jagged Striped Pirate Skirt offers a slashed hem design that recreates a pirate-y vibe. The white fabric of this Girls Pirate Blouse lends it a subtle appeal, yet also offers versatility. Thanks to its simple style, this blouse is one that can be easily work well with other pieces, allowing for dozens of different looks! 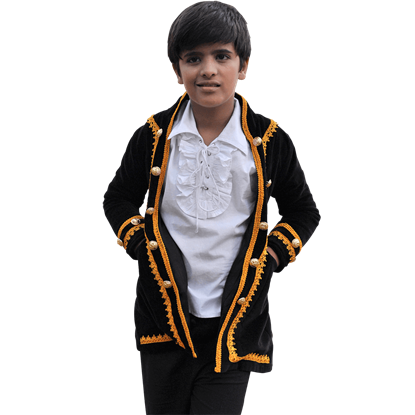 This classic take on a pirate coat is shrunk down from the typical size to make it appropriate for a youth to wear. 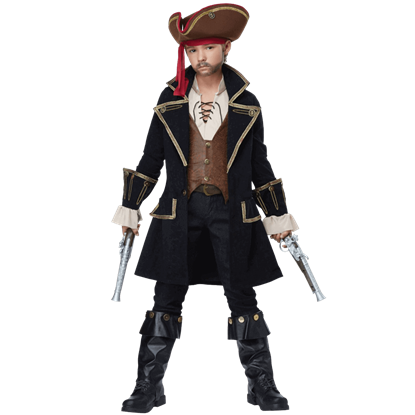 This way, even a child can become a pirate captain, so long as they wear this Kids Captain Jack Pirate Coat. This vest looks like it was taken from the wardrobe of a pirate captain! 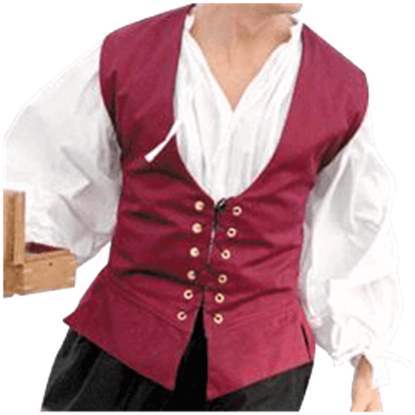 Smaller in size than typical pirate garb, this Kids Captain Jack Pirate Vest is perfect for a youth, ensuring that the young can look like a captain of the sea.